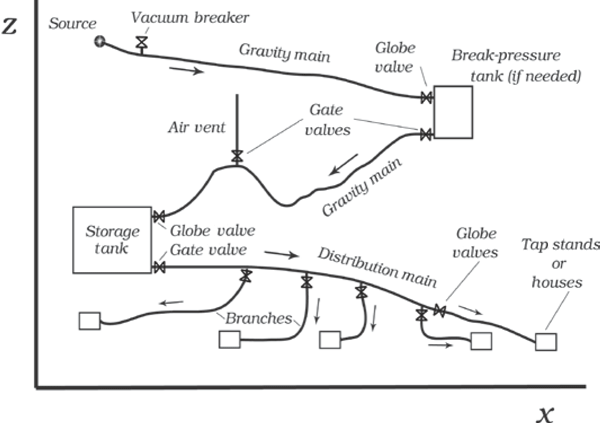 Modeling can be used to overcome water jar test limitations. In this research study, MLP-type ANNs with one hidden layer have been used for modeling jar tests to determine the dosage level of coagulant used in water treatment processes. The data contained in this research have been obtained from the drinking water treatment plant located in the Ardabil province in Iran. To evaluate the performance of the model, the mean square error and the correlation coefficient parameters have been used. Reliable and effective continuous water quality monitoring has always been challenging. To detect water quality, deployment of multiple sensor nodes in a water distribution network generates complex and convoluted data sets. This paper demonstrates the implementation of a cyber-physical system along with soft-computing approaches (Python and fuzzy). The designed system monitors water quality in real time, simplifies the complexity of sensor data and assists water engineers in decision making. Using real-time uncertain measurements from a real water transport network, the proposed Iterative Hydraulic Interval State Estimation algorithm generates bounds on hydraulic states, by taking into account the measurement uncertainty and modeling uncertainty in the form of uncertain pipe parameters. The applicability of this methodology was demonstrated by using it to estimate the unaccounted-for water in the network. This methodology can be used as a tool for fault detection in water networks. EPANET does not always conserve constituent mass during water-quality simulations. The failure to conserve mass can result in significant errors in constituent concentrations. We document the occurrence of mass imbalances, explain why they occur, provide recommendations for minimizing mass imbalances, and present a preliminary water-quality algorithm for use in EPANET that always conserves mass. Our paper should be of interest to anyone who performs water-quality simulations using EPANET. Public drinking water distribution systems can be contaminated. Sensors designed to detect contaminants can provide warning through the use of a contamination warning system (CWS). A properly designed CWS may help reduce the consequences associated with contamination events. Various factors can affect the performance of a CWS design, our paper focuses on the accuracy with which the network model of a distribution system represents the actual structural details of the water distribution network. This work is an outgrowth of engineering service learning at Villanova University in Pennsylvania, USA. Teams of students assess and collect data on site, and design and communicate information for clean water networks that benefit developing areas around the world. The design of a water network requires the selection of pipe diameters that satisfy pressure and flow requirements while minimizing cost. This work contrasts and compares results of several models and makes key recommendations.